The size of Presto 07045 Family-Size Cool-Touch Tilt’N Drain Electric Griddle is the most noticeable feature. Though the square shaped surface doesn’t look very large its dimensions are 19.25×15.8×3.9 inches, which is far from being small or even average. 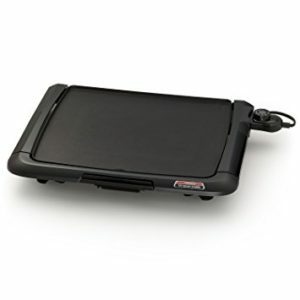 This Presto griddle offers a spacious cooking surface of 14.25”x15.5”. Like many other griddles, this model also has the nonstick coating on its cooking surface. The other feature it includes the tilt n drain functionality as its name says. This feature allows you to tilt the griddle in order to drain the unwanted grease and oil while cooking or simply use the appliance on the level position depending on what you are cooking. The body of the griddle is made of cast aluminum, which is light, quite rigid and good for even heating. And it is virtually warp-proof. The cooking surface has a premium nonstick coating that reduces the amount of oil needed and making the food healthier. Safety measures need to be taken not to scratch the surface and metal instruments should not be used as they scratch and peel out the nonstick coating. 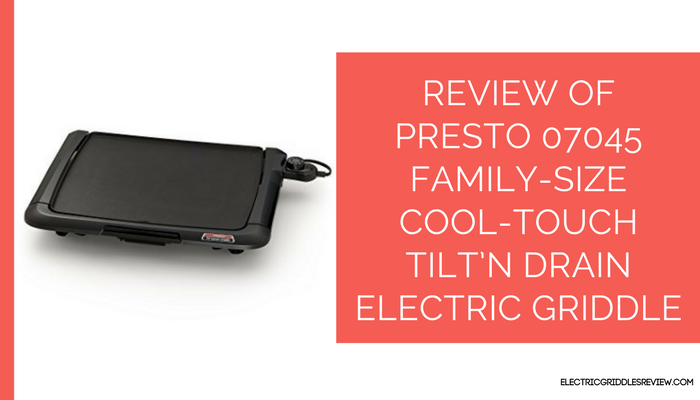 This model of Presto electric griddle has a cool touch base, which offers the safe maneuvering while cooking on it. But still, like any other electrical appliance, it is important to read the manual that comes with the product and follow the given instructions. The nonstick coating on the cooking surface prevents the food from sticking and makes the cleaning process easier. Though its larger size can make the cleaning process bit difficult since not every sink can fit it in. Its heating control is detachable and after its removal, the griddle is fully submersible in warm, soapy water for cleaning. This model is also dishwasher safe. A control master heat control maintains proper cooking temperature automatically. Nonetheless, some users have complained about its uneven heating when needed. The area near the heating element is hotter than rest of the cooking surface. Also, the cooking surface tends to warp while using high heat for cooking. As much as it is easy to clean, it is not so easy to store it. Because of its large size, it takes much space on both kitchen counter and cabinet. If you don’t have enough space to store it, don’t think of buying this model. It’s handy to cook food for the crowd but on the other hand, its storage can be a problem. Before buying it, make sure to make enough space for this because not every kitchen cabinet can accommodate the Presto 07045 model and neither can every kitchen countertop. Another good point about this Presto cool touch electric griddle is its price; it is real cheap and attractive compared to other griddles. But you can always go for expensive and better quality griddles if you want. The efficient square shape of the cooking surface accommodates more pancakes, eggs, and bacon. But some users have complained about its cooking surface and uneven heating. Besides that, the tilt n drain feature is just great as it keeps the unit grease-free.